CHITTENDEN — Judith Sargent of Chittenden, Vt., is getting creative in the fight against Parkinson’s disease. She is one of 13 artists whose artwork was selected to appear in the Parkinson’s Disease Foundation’s (PDF) 2014 Creativity and Parkinson’s Calendar. Her paper collage, entitled “Autumn Frolic,” appears in the month of October in the nationally-distributed charity calendar which helps to raise awareness of Parkinson’s disease. Sargent, who lives with Parkinson’s disease, says she began scrapbooking and paper cutting shortly after her diagnosis in 2005, finding a therapeutic release in the activities. Since then, inspired by her 18 grandchildren, she has used these skills to create six personalized children’s books all of which feature pages of her unique paper collage illustrations. “When I’m working with small pieces of paper for my books and collages, it helps calm my hands from shaking and mentally sharpens my focus. Creativity is helpful to me on many levels while living with Parkinson’s, especially by reminding me of what I can still do,” she says. Sargent is one of nearly 400 other artists living with Parkinson’s who have shared their artwork and experiences with PDF’s Creativity and Parkinson’s Project. The Project explores, supports and encourages the therapeutic value of creativity in Parkinson’s. 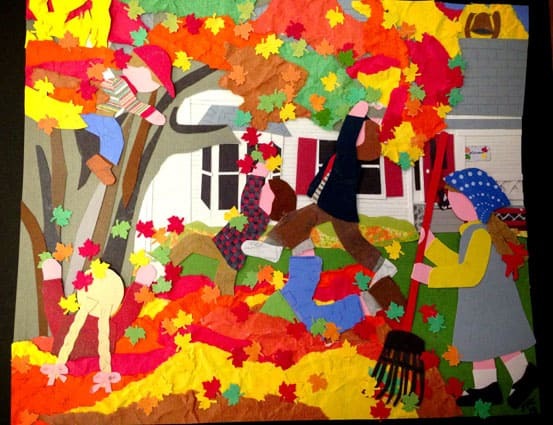 Her collage, made with intricate pieces of red, brown, yellow and green paper, depicts her grandchildren raking leaves in her front yard. It was chosen among these individuals’ works to be featured in PDF’s annual print calendar, which is distributed nationwide to nearly 20,000 people. For more infoabout the Creativity and Parkinson’s Calendar, contact the Parkinson’s Disease Foundation at (800) 457-6676 or info@pdf.org. I am so pleased to see this article with my wife’s art work and her challenges with Parkinson’s.